Crafty Kitty's Crafting Journey: Another creation! If you've seen my posts in recent days, or if you talk to me often, you'll know I've become shamelessly addicted to the jewellery channel! Well, my beads have arrived and I was so excited to get my hands on them! Now I promise this is related, but for Xmas, I bought my mum a black cashmere roll neck jumper - just begging to be accessorised! 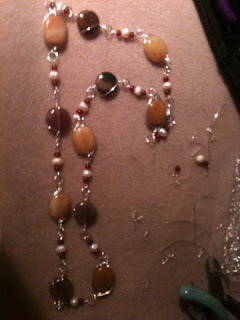 So what else could I do when I received these beautiful gems but make my mum a striking necklace! 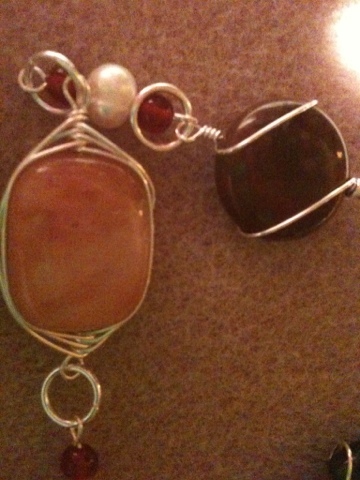 Here, I've used wire wrapping techniques to accentuate yellow jasper and puffy jade ovals, and connected them with jump rings and alternating pearls and red agate rounds. Might have to make one for myself now! Gorgeous! Mom will undoubtedly love it!